A. Alabama . The pre-championship bowl season was characterized by snooze-fest after painful snooze-fest. Nick Saban certainly won't complain that his team was one of the culprits. Alabama overwhelmed Michigan State 38-0 in last Thursday's laugher of a Cotton Bowl. In fairness to the Spartans, however, their 10-0 deficit at halftime constituted a borderline thriller compared to many other bowls. The Crimson Tide are -7 favorites over Clemson in the championship game, according to GT Bets. B. Browns . Black Monday included Cleveland giving Mike Pettine the boot. On the bright side, he won't have to answer any more questions about Johnny Manziel…at least not unless he takes some coaching position with, you know, the Cowboys. C. Chapman, Aroldis . The Yankees successfully traded for Chapman last week, not long after his shipment from Cincinnati to the Dodgers was blocked because of an alleged domestic violence incident. But, hey, the Yanks have won just a single World Series since 2000 (2009) and they are in win-at-all-costs mode. MyBookie.ag has New York at +1400 to win the World Series. D. Derrick Rose . The good news for Rose is that perhaps for the first time in history, one of his MRI's revealed no serious damage. The bad news is that he needs MRIs on a daily basis. Monday's negative test allowed Rose to take the court on Tuesday, and he scored 16 points in 35 minutes to lead Chicago past Milwaukee 117-106. The Bulls are +800 at Bovada Sportsbook to win the Eastern Conference. E. Ejected . Ohio State linebacker Joey Bosa was ejected in the first half of the Fiesta Bowl for targeting. The Buckeyes still managed to get the best of Notre Dame 44-28. Given that Bosa had already made known his intentions to enter the 2016 NFL Draft, commissioner Roger Goodell will probably try to fine him for the hit. F. Forte, Phil . Forte, a guard for Oklahoma State, is expected to miss the remainder of the season because of an elbow injury-at least according to what head coach Travis Ford had to say earlier this week. The senior was leading the Cowboys with 13.3 points per game when he went down during a game on Nov. 19. G. Green, Aaron . The TCU running back capped off his team's incredible Alamo Bowl comeback from 31-0 down at halftime with a touchdown run late in the fourth quarter. The Horned Frogs eventually prevailed 47-41 in overtime. So backup quarterback Bram Kohlhausen is basically the second coming of Frank Reich. H. Harper, Bryce . Harper was recently named baseball's "Person of the Year" by ESPN.com. Maybe if the worldwide leader changed "Person of the Year" to "Player of the Year," it would be onto something. I. Izzo, Tom . Michigan State star Denzel Valentine presented his head coach with the game ball following the Spartans' 69-61 road win over Minnesota last Saturday. Izzo's father had recently passed away at the age of 90. R.I.P. Carl Izzo. J. Jets . It was all right there for the Jets to make the playoffs for the first time since the 2010-11 campaign. They controlled their own destiny heading into Week 17 thanks to a five-game winning streak. But it all came crashing down for New York on Sunday. An upset loss at Buffalo combined with Pittsburgh's win at Cleveland means it is the Steelers who are postseason-bound as the AFC's No. 6 seed. K. Kenneth Faried . The Nuggets' forward suffered a neck injury and got carried out on a stretcher during last Saturday's loss to Golden State. One day later, Faried scored 13 points and grabbed nine rebounds while playing 27 minutes against Portland. That's the Manimal for ya. Denver is a +3.5 underdog at Minnesota on Wednesday, as indicated by WagerWeb. L. Leicester City . A tie for first place in the English Premier League became a solo second position for the Foxes following last Saturday's action. They drew 0-0 with lowly AFC Bournemouth, while Arsenal took care of Newcastle. Moreover, Manchester City is now within one point of Leicester after the Sky Blues stormed back for two goals in the final 10 minutes to overcome Watford 2-1. BookMaker has Man City as a +120 favorite to win the EPL title. M. Manning, Peyton . Thanks to Brock Osweiler's mediocrity and the Patriots' late-season collapse, Manning is suddenly the starter for the AFC's No. 1 seed. Maybe following his brother's playoff progress will help Eli forget about Tom Coughlin's departure from the Giants. The younger Manning looked pretty devastated in Coughlin's farewell presser. N. No. 1 . It was a No. 1 vs. No. 1 battle in college basketball on Monday night. That's right; Kansas tops the AP poll, while the coaches rank Oklahoma in the first slot. And to say the two teams did not disappoint would be a massive understatement. An instant classic that needed three overtimes to decide a winner saw the host Jayhawks outlast Buddy Hield (46 points) and the Sooners 109-106. O. OVI . Former Ohio State running back Maurice Clarett was charged with operating a vehicle while impaired last weekend. Just when it seemed like Clarett was back on track, now he looks like the previous generation's answer to Manziel-except that he has never been reported as having gone to Vegas disguised and using the name "Billy." P. Patriots . The Pats-or what's left of them-will not have home-field advantage throughout the AFC playoffs following a worst-possible series of events last weekend. New England got upset 20-10 at Miami then watched Denver scrape past San Diego 27-20. Thus, Peyton Manning and company stole the No. 1 seed, meaning the Patriots will go on the road to face the Broncos in the AFC Championship if the two teams win their respective openers. Q. Quarterbacks . Saturday's wild-card battle between Cincinnati and Pittsburgh will not be the first time A.J. McCarron and Ben Roethlisberger have met. When McCarron was 13 years old, Roethlisberger gave him a sweaty wristband after leading Miami (OH) to a GMAC Bowl win over Louisville. According to the odds, Big Ben is expected to give A.J. something else this weekend: a playoff loss. 5Dimes Sportsbook has the Steelers as -2.5 road favorites. R. Rafael Nadal . The Spaniard is coming off an un-Nadal-like 2015 campaign in which he won no Grand Slam titles, did not even make it past the quarterfinals of a major, and finished at No. 5 in the world. But he opened this season-unofficially-with a title at a prestigious six-man exhibition event in Abu Dhabi with wins over David Ferrer and Milos Raonic. S. Stephen Curry . Curry's leg injury is not serious, indicated by the fact that he played on both Monday and Tuesday in Golden State's respective wins over the Hornets and Lakers. As such, we can talk about what's really important: Burger King. A recently-unearthed Burger King commercial stars a young Curry and his father, Dell. Not surprisingly, it's must-watch material. The Warriors are +155 at BetOnline Sportsbook to break the NBA record and win at least 73 regular-season games. T. Trainor, Meghan . Trainor was spotted after last weekend's American Music Awards hanging out with none other than Clippers' center DeAndre Jordan. The two were in cohorts at The Nice Guy restaurant in West Hollywood before making off in the same car. "Dear future husband"…? Well, let's not get ahead of ourselves. L.A. is a -4 favorite at Portland on Wednesday, per Bovada Sportsbook. U. Urlacher, Brian . Urlacher has hair. That's right; Brian Urlacher has hair. The breaking news hit the sporting world on Tuesday, eight months after the former Bears' linebacker had a "procedure" done. Urlacher "didn't think it would be a big deal" but realizes now that "people are going crazy." LeBron James hope there's more where that came from. V. Venus Williams . Venus lost to someone called Daria Kasatkina in the Auckland first round on Monday. Serena's year began with a withdrawal from the Hopman Cup, a team competition in Perth. The world No. 1 cited a knee injury. It's safe to say 2016 is off to an inauspicious start for the Williams sisters. Serena is a +200 favorite at MyBookie.ag to win the Australian Open; Nadal is +800 on the men's side. W. Watson, Deshaun . The Clemson quarterback and third-place finisher in the Heisman Trophy voting threw for 187 yards and one touchdown while rushing for 145 yards and another score in his team's Orange Bowl beatdown of Oklahoma. Only Stanford running back Christian McCaffrey thinks those numbers are mediocre. X. Xavier Rhodes . In a winner-take-all showdown for the NFC North title, Minnesota went into Green Bay last Sunday night and upset the Packers 20-13. Rhodes picked off Aaron Rodgers once and batted down a last-play prayer in the endzone. The Vikings' reward for clinching the division title is an opening playoff game against Seattle; the Packers' reward for losing is a date with the Redskins. Something ain't right about that. Minnesota is a +5 underdog at home on Sunday, as indicated by BookMaker. Y. Yzerman, Steve . Lightning forward Jonathan Drouin has requested a trade, but he better not get his hopes up. Yzerman, the team's general manager, insists that he will continue to "act in the best interest of the Tampa Bay Lightning hockey club" and that he expects Drouin to continue reporting to the AHL affiliate Syracuse Crunch. That's where the 20-year-old was sent last weekend. The Lightning are +1000 at GT Bets to win the Eastern Conference. Z. Zero . Spurs' forward Tim Duncan scored zero points for the first time in 1,360 NBA games when his Spurs drubbed Houston 121-103 last Saturday. 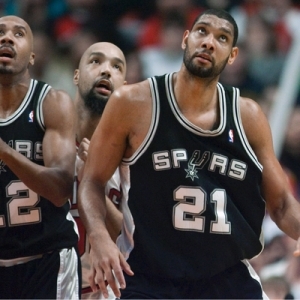 Duncan missed all three of his field-goal attempts in 14 minutes. The 39-year-old's streak of 1,359 games with a point is the longest to begin a career in NBA history. Michael Jordan never went scoreless, but he played in only 1,072 contests.